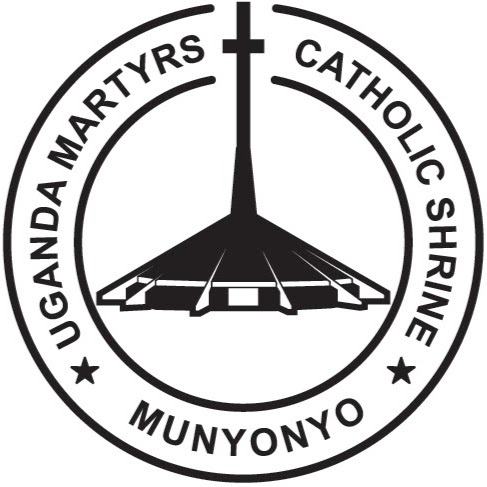 Therefore The Archdiocese of Kampala with The Grayfriars prepared a concept design to be implemented as a revive of the forgotten shrine. 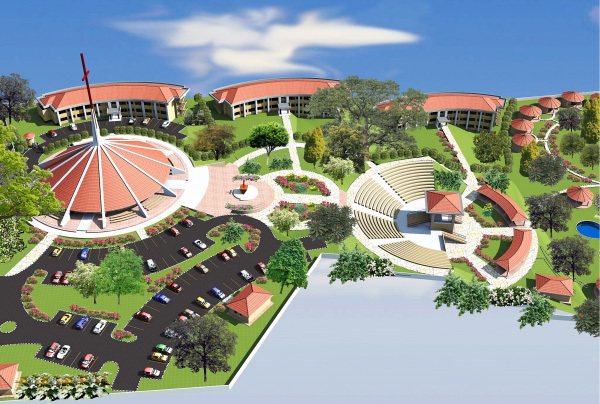 In the first three year of the project Church, Formation Centre, Information Centre, toilets and parking were already constructed. The master plan layout was developed using the unity concept as discussed above. 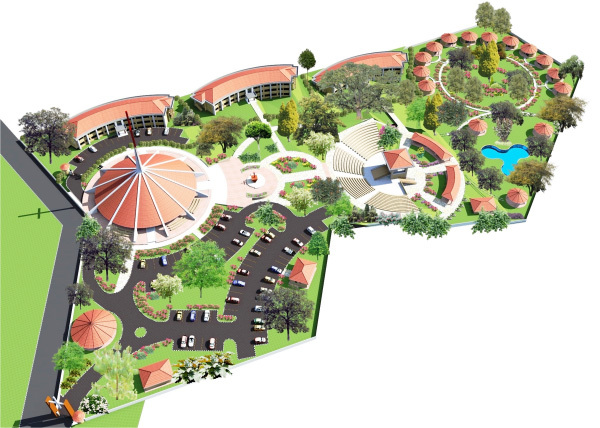 As seen in the masterplan, the noisy areas such as the parking, accesses and pilgrim areas have been placed on the left hand side of the shrine so their noisy activities donot disrupt activities in the quiet areas such as the retreat house, Formation house, meditation gardens and pilgrim cottages among others. 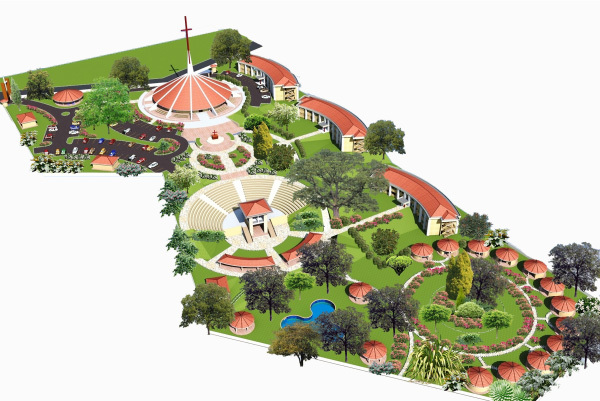 As seen in the master plan, the shrine, martyrdom and amphitheater were designed along the same axis to form a ray of spirituality and create a sense of focus for the congregations visiting the facility. This was placed at the highest part of the site to enable visibility from different locations in Kampala. The shrine has a total floor area of 1370 Square Metres shall accommodate a minimum of 1400 people. Fixed concrete benches are also provided around the shrine to accommodate more numbers. Please note that the appearance of the shrine in the artistic impressions is not the final but rather an expression of the intended concept that shall be used to develop a more comprehensive master piece that shall define this facility as a holy sanctuary. This has been maintained in the same location but the interrior and Alter above have been redesigned to match the aesthetics of the new development. This has been designed within the slope of the site making it less expensive. 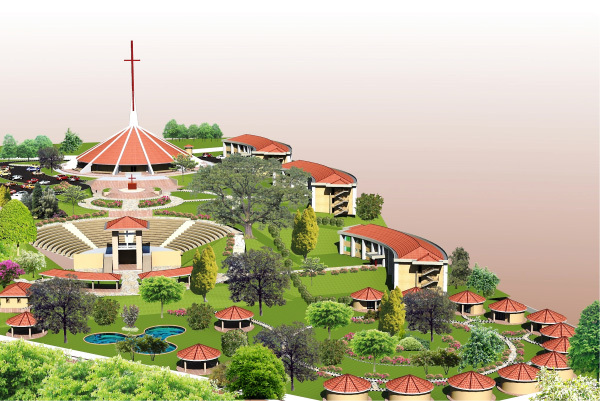 The amphitheater has been designed and oriented around the covered Alter above the tomb of St. Andrew Kaggwa and shall accommodate a minimum of 4000 people. This has been placed at the right hand side of the shrine which is a more quiet area. The formation house will have 2 floors (ground and first floors) with a total floor area of 1387.5 Square metres. This building will accommodate a classroom, kitchen and dinning room, 2 living rooms, double rooms for 30 residents (15 in number) with other support facilities such as circulation, stores, laundry ,showers and toilets . This has also been placed at the right hand side of the shrine which is quiet and has two floors with a total floor area of 1387.5 square metres. This block will accommodate 30 self containedrooms , kitchen and dining rooms, living room and other support facilities such as circulation, stores, laundry ,showers and toilets . This will have 2 floors with a total floor area of 1400 square metres. The building will accommodate 2 halls, ameeting / conference room, dining rooms, kitchen and other support facilities such as toilets and stores among others. This has been placed near the main entrance gate and will be used as a point for information and inquiry by visitors or people accessing the facility. The information center is circular or round in form and has a total floor area of 146 square meters with facilities such as outdoor porch for visitors, reception and some support offices as well as support spaces such as toilets and stores. Parking space has been provided for next to the entrance gate to keep the noise in one area and allow for meditation and other quiet activities on the right hand side. Also parking has been provided at the formation house accessed from the rear side of the shrine. Support facilities provided for include toilets and canteen located at different convenient parts of the site as seen in the master plan. The entire area shall be well landscaped to not only attract visitors but also create a confortable , calm and ideal environment for meditation.